Most of us spend a third of our day at our desk. In our pursuit of healthy living, we often need to take the mountain to Muhammad rather than the other way around. I use a timer for two reasons. The first is to help limit activities that are time-sensitive such as coaching calls, where I want to respect your time and ensure we finish when we are due. Social Media can be fabulous and frustrating all at the same time. I will often set a 10 minute timer before I pop into Facebook to ensure I don’t get lost in there! The second is to remind me to get up every hour and move for two minutes. If you have a fitness watch, you may have a setting on it to prompt you to move. Research is showing that being active for just 2 minutes every hour has health benefits. We all have good intensions when it comes to eating our 5 a day. However, often if the fruit is not right in front of you it does not happen. An apple and 2 satsuma’s are 2 out of our 5 daily portions. I love oranges because of their vibrant colour and the smell is always invigorating. They are also a bit messy to eat, which means you need to take a wee break to eat them or your keyboard gets in a mess, and then you need to get up and wash your hands encouraging you to move a bit more again! We become more sensitive to sugar in our menopausal years that includes fruits, however apple and citrus fruit both have more fibre than sugar which help keep our blood sugar levels on an even keel. The elixir of life and is so simple a healthy habit that we often don’t do it! I pop a 750ml bottle on my desk and aim to drink it in the morning then fill it up at lunchtime for round two in the afternoon. I drink a lot of herbal tea as well so between the two I get more than 2 litres a day. Water becomes important in your menopausal years particularly if you ‘run hot’. The amount of water your body requires might have gone up if you ‘glow’ a lot. You can easily become dehydrated when you are menopausal and this may affect how hungry you are, how foggy your brain is, your digestive system and so on. 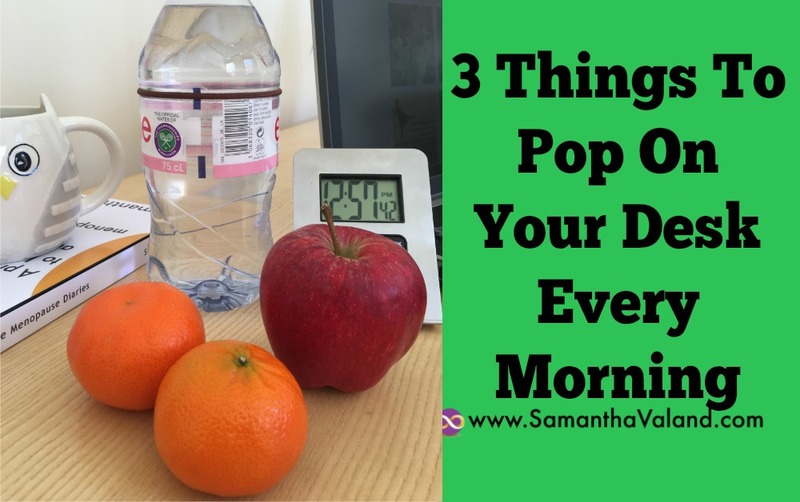 So there you have it, my 3 things to pop on your desk every day. What would you add to that list? Please let me know!